We love the annual Iowa City Jazz Festival, held over the Fourth of July weekend, and go whenever we can. It’s a road trip from Minneapolis, but you can take a detour en route and visit a Frank Lloyd Wright site or two: Cedar Rock in Independence, the Wright-designed Historic Park Inn Hotel and the Stockman House (with interpretive center) in Mason City. You can get lost and stumble across a farmers’ market. You can get distracted by wind farms, green fields, and silos, forget to pay attention, and end up crossing the Dubuque Bridge into Illinois. That adds a lot of miles. Don’t ask how I know that. But if it’s a nice day, the drive can be the perfect head-clearing transition between life in the city and three days of music in a charming university town in the heartland. Here’s why this year’s festival is so worth attending. 1. Awesome headliners. This is the festival’s 25th year, and the organizers have gone all out to make it truly memorable. These are the headliners, in alpha order: Ben Allison Think Free. Brian Charette Trio. Dave Douglas and High Risk. Julian Lage Trio. Charles Lloyd Quartet. Rudresh Mahanthappa Bird Calls. Becca Stevens Band. 2. Variety. Let’s look more closely at the headliners. Ben Allison Think Free: A bassist-led band including Jenny Scheinman on violin and Rudy Royston on drums. Brian Charette Trio: A B3 player/pianist-led band including Rudy Royston on drums. Dave Douglas and High Risk: A trumpeter-led electro-acoustic quartet, with a DJ. Apparently this comes out of an earlier ensemble called Keystone, which we saw at the Walker in 2010, so we’re really intrigued. Julian Lage Trio: A guitarist-led trio. Vibraphonist Gary Burton knows how to pick guitarists for his band; Lage was the successor to Pat Metheny and Larry Coryell. Lage is a beautiful player. Charles Lloyd Quartet: A saxophonist-flutist-guru led band. Lloyd is one of our most important living musicians, a jazz giant and newly minted NEA Jazz Master whose influence is far-reaching and whose music is profound. 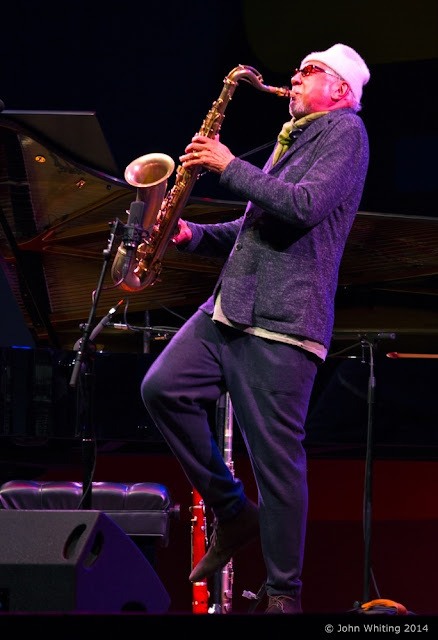 Festival committee chair Don Thompson told the Iowa City Press-Citizen: “I’ve dreamed of having Charles Lloyd play our festival since I became involved many years ago.” Lloyd’s band: Gerald Clayton, Joe Sanders, Kendrick Scott. We’ll see them in Minneapolis a few days before Iowa City, because missing a live Charles Lloyd performance is not an option, and seeing him twice in one week on two different stages is an impossibly rare opportunity. Rudresh Mahanthappa Bird Calls: A saxophonist-led band, a fusion of modern jazz with South Indian classical music. Mahanthappa is a Doris Duke Performing Artist and a very powerful player; Bird Calls is his take on Charlie Parker. Can’t wait to hear it live. Also on the main stage: Atlantis Quartet. The popular and beloved Minneapolis modern jazz group recently won a prestigious McKnight Musician Fellowship. We’ll be cheering especially loudly for them. They write strong, solid original music and they play it very well. And this, recently added: Charles Lloyd’s wife, artist and filmmaker Dorothy Darr, made a documentary film about Lloyd called Arrows Into Infinity that chronicles his life in music, his spiritual journey, his great friendship with the drummer Billy Higgins and more. The film screens at the Iowa City Public Library at 2 p.m. on Friday, to be followed by a q-and-a with Lloyd and Darr. 3. Smart scheduling. The headliners are on the main stage. No one else plays during their performances. In between the headliners, who perform every two hours, three side stages light up with local musicians and young musicians. Guitarist Steve Grismore, a co-founder of the festival, plays with his trio on Thursday. The electro-jazz ensemble Koplant No plays Saturday. So does the Dakota Combo, a group of high school musicians from Minneapolis. View the whole schedule here. 4. Location, location. Iowa City is compact, idyllic and scenic. A university town on the Iowa River, it’s lovely to walk around, with shops and galleries (AKAR, Iowa Artisans Gallery) and restaurants, patios, and places to sit. The city is home to the University of Iowa, which is home to the world-famous Iowa Writers’ Workshop, so all along Iowa Avenue you’ll find bronze plaques in the sidewalks with authors’ names and passages from their works. The city is one of just eight UNESCO-designed “Cities of Literature” in the world, and the only one in the United States. The festival takes place on a lush green lawn in front of the Old Capitol, and on Clinton Street and Iowa Avenue, which are closed to traffic and open to aimless rambling. Following the final headliner (this year, Charles Lloyd), there will be fireworks over the river, visible from the festival site. The fireworks are always a perfect ending to the festival. As a university town, Iowa City is full of students. It can be noisy at night, and the bars are usually ear-splitting and overflowing. If you’re not in your early 20s, there will be moments when you feel old. That’s just how it is. On the other hand, it’s kind of nice to be among all of those short shorts, halter tops and beards, even as a tourist. And – this is one of the small miracles of the Iowa City Jazz Festival – you can take your chair to the festival site mid-morning, set it up where you want it, return hours later for the music, and your chair will still be there. 5. Good fair food. Seriously. You can buy fried stuff if you want, but you can also buy amazing grilled and roasted stuff, and Indian food and other spicy, tasty edibles. You might want to make a dinner reservation for one night, but you can eat well on the street, without a reservation. 6. It’s free. Because of the generosity and civic-mindedness of many sponsors and supporters, every second of music at the festival is free. So thanks to the University of Iowa Community Credit Union, and MidWestOneBank, and Integrated DNA Technologies, and Oaknoll Retirement Community, and everyone else who stepped forward and put money in the bucket. Volunteers will be carrying buckets through the crowd during the festival, if you feel moved to make a contribution.